If Soane could build a tower I wonder what it would be like? Yes, I've sometimes wondered about that. I thought of trying to redesign Bakers bank in the style of Soane, and preserving more of Soanes original work. Then I thought about doing it so that it could expand vertically, ie more like Soanes bank which is an accumulation of disparate parts welded together, like a medieval city that evolved over time. But would he have been able to abandon ornament completely and still stay true to himself? How would he have avoided the awful pastiche of so much Post Modernism? Not sure if it's possible but I think he would have tried, if he had lived to be 200!!! Like Soane, Terragni saw himself as expressing the spirit of Ancient Rome in a modern setting, using modern materials. Would Soane have designed a bit like this if he had been working in 1935? It has the complexity and the layering, the top lighting and manipulation of space, ambiguity .. Interior space, surprising shafts of light from above. Was Terragni aware of Soane? Not as far as I know, but there are interesting parallels ... much more than I had realised (before today). The images are from a model of Casa del Fascio that I built several years ago. Amazing how it comes to life when viewed using Enscape 3d. The glass blocks are too transparent in Enscape, but I just saw the parallel between the way Soane connects rooms together in his own house, with openings above eye leve, over bookcases etc, and the way Terragni puts glass blocks above door head height to let light diffuse between the perimeter offices and the atrium. As Daniel Abrahamson has pointed out, Baker tried to preserve something from the work of the previous architects of the Bank (Soane, Taylor, Sampson) but for his entirely new central block, opted to reference Christopher Wren's very popular brand of classicism, which is seen in the popular imagination as quintessentially English. He deliberately turned away from what he perceived as Soane's dry, esoteric, approach towards something more populist. And he argued that Soane didn't treat Taylor's work with much respect, so why would he be totally reverential to Soane? I think that was a valid argument at the time. It wouldn't stand up in today's "heritage-conscious" world. There would surely be a more vigorous attempt to retain more of what remained of all three architect's work, and not just by incorporating "tributes" using your own reinterpretation of their style. So I think it's very interesting to imagine how an attempt to remain true to Soane could have worked itself out and in that spirit, I've had a first bash at creating something along those lines. It's very schematic at present, but I've tried to take a more additive approach. This is a building that could be extended and adapted in stages, as the bank was during Soane's tenure. It's a jumble of parts jostling with each other inside the limits of the city walls. I try to hint at how "Soane style" could be applied to, the 5 to 7 storey blocks around the periphery. Then as a tower starts to emerge from the middle of the site (let's say in the 1980s) The style shifts into more of an expressed frame, with a bit of a nod towards Terragni. Hopefully, I will get around to developing this idea further in future. Or maybe someone else would like to pick it up. Come to think of it, it would make a very interesting student project. Anybody out there in the architecture schools like to give it a go? Just getting back to the original chat. I was prompted to look closer at Pitzhanger Manor, and the extent of Soane's estate. I compared his original survey of the land he purchased with Walpole Park as it exists in Ealing right now. It's a very close match, and it's a great space, as I found out on my recent visit. I have come to realise just how rapidly Soane rose into the landed classes from a very humble background. Rags to riches, like a Dickens novel perhaps. We think of England in the colonial period as a terribly oppressive class society, but there were also tremendous opportunities for people with exceptional abilities operating within a rapidly expanding economy. I have been thinking a lot recently about how judgemental human beings can be. I guess it was advantageous for our ancestors to jump to conclusions based on scanty evidence rather than forming a committee to examine each threat that came along in an objective manner. But the implications today can be unfortunate. John Soane lived towards the end of the enlightenment period when ideas of tolerance, freedom of speech, the secular state and parliamentary democracy began to take shape in Western Europe. It's easy to be cynical if you grew up taking these things for granted. Clearly the reality is fragile and flawed when compared to the lofty ideals, but isn't that the point? Life comes in shades of grey. Be suspicious of moral panic and slow to label another "tribe" as enemies of truth. We have amazing tools at our disposal. How can we best use them to understand our history and imagine possible futures ? That's my "BIM pencil" challenge for the week. Take care. Sadly this is already more that a week old. Read on. It's been a bit of a disastrous few days for me. Maybe that's putting a melodramatic spin on it, but firstly I am recovering from a very sore shoulder which seems to be a result of posture and mouse use. I actually spent the last day of the week trying to use my left hand. Interesting, but very clumsy. It makes me realise how much of my time is spent in dialogue with a computer screen. It's been extremely wierd spending a three day weekend almost completely ignoring my laptop. Which brings me to the next catastrophe. The wonderful new laptop I received from HP as a reward for my work on Project Soane has suddenly stopped working. Fortunately I have my old machine and just about everything is backed up via OneDrive, but it still feels like a mortal blow. There will be the usual complaints about nested CAD, but I am over this now. You can't model something like this convincingly with Revit native geometry. It's not the kind of shape that those tools were designed to make. Here is a nice smooth version, all ready made, so let's use it. Solids are great for things that need to be sectioned. That doesn't apply to furniture. Mesh is the way everyone models this kind of stuff for visualisation, movies, etc. The minute you try to get half way to modeling these double curved shapes with native tools there's going to be lots of gymnastics cutting with voids and the file size will shoot up. Really, I love some of the stuff that has been done for people like Herman Miller, but looking through that again, there is nothing that comes close to the smooth flowing tapered curves of a chair like this. Add to that the whole "cross-platform" debate and I just don't see the point of turning your noses up at mesh geometry. Revit can handle it. We know how to hide the edges. File sizes are very reasonable. So if someone has already done the modelling for you as a CAD mesh, gobble it up. Having hidden the edges in 3dmax, exported to DXF2014 and resaved as DWG, I inserted the mesh into an RFA template. For the most part the geometry was already sorted into layers by material. I just had to put the wheels on to a different layer. The layer names weren't very helpful, so I renamed them in Object Styles, which is of course where you go (within the project environment) to apply materials. Revit has this habit of creating a bunch of materials with dumb names (Render Material 0-0-255, etc) I like to delete all these. Then I usually apply some of the default materials to the layers, just to give some definition to the family, which will also show up in the thumbnail. I use the default materials because I believe in sharing with the global Revit community, and I don't particularly want to inflict my material naming conventions on everyone else. It's called being polite. The next point of controversy is the use of symbolics. I'll state my position once more. I like to be able to produce crisp linework on sheet sets. Maybe it's because I grew up drawing by hand, maybe it's because I think people respond better to visual communication that delights the senses. Look at web site design, advertising, company logos, product packaging. We have a sense of beauty and elegance, and we are subconsciously influenced in positive and negative ways. "Old Fashioned" ideas of draughtmanship and layout do matter, whether you are trying to sell a design to a client, or communicate intentions to a construction worker. So messy, fuzzy edges to furniture objects in my plans and elevations really bug me. They also bug senior management who don't need to have their negative prejudices towards BIM confirmed. In short, I may be working left handed at the moment, but I don't want my families to look like they were drawn that way. So I have chosen to create crisp linework and masking regions in the 3 orthographic planes. Revit doesn't make it easy for me to differentiate between front and back elevations, but usually front will do fine. Here I am going to agree with the CAD haters. There are 2D CAD files in the download, and it would save a bit of time to use these, but I want to have masking regions anyway, and I usually find that manufacturer drawings show too much fine detail for architectural purposes. I'm not going to be using these at a scale of 1:5. I want them to look right at 1:20 & 1:50. So I am redrawing and simplifying as I go. I have also introduced a certain amount of "coarse-medium-fine" differentiation. It's quite subtle, but might as well do it while I can. But what about the 3d geometry? Do we need 3 versions? I suggest not. I hate the all-purpose boxes that are so commonly used. What's the point if you can't tell whether it's a chair or a WC? But it may be worthwhile using 3 simple extrusions to represent a generic task chair. Have that for coarse 3d views and the CAD import for medium and fine. Use symbolics in plan/section/elevation. Finally I tried a quick render ... could this be another downside of meshes? Seems like the seat is distorting render bitmaps in rather strange ways. The back is fine, so maybe it's not meshes per se that are the problem. Might be worth exploring that a bit more some time. In any case it's only really an issue with large scale patterns like the striped fabric. Anybody else want to help make families like this from available 3d CAD? Fancy a bit of crowd sourcing? Or maybe we could make some "collections" up ... like this one I assembled from an Italian furniture maker that I stumbled across. Seems to me that even half a dozen experienced Revit users willing to cooperate on something like this could significantly improve the range of content available online. By the way it's about 900kb which is much smaller than it would be if you tried to do this with Revit native geometry. even if you accepted lots of sharp edges where this is nice and smooth and rounded off. Oh, and while we're here, Kak-Handed, or Cack-handed as some would have it, means left handed in the part of the world where I grew up, and my association comes to mean "incompetent"
On that note, here's a recent quote from a government minister in my home country of Zimbabwe, and I can assure you it was said in all seriousness. I an recently back in Dubai after 2 glorious, eventful weeks in the UK. I'm going to review it backwards. Maybe that will shed fresh light on the experience, a bit like holding a picture upside down, or viewing it in the mirror. The climax was a gig in Reading with my "schoolboy band", the core of the band being 3 of us who were at Barnsley Grammar School together in the 1960s. By coincidence I watched "8 days a week" on the return flight which was another way of reliving that startling decade. I did a short solo set at the beginning of the evening which went down really well. Great to be performing again. I had spent a few days staying in Reading with my old friends Jo & Ian, practising during the days, talking in the evenings. I got to walk around the neighbourhood a bit more than I have before and enjoyed the red brick architecture with decorative banding. Clearly it is influenced by the nearby Reading School by Alfred Waterhouse, as well as local vernacular tradition. I would love to know more. On the Friday morning I took the train into London to meet Jenni Muir of the Bank of England Museum. We had a very interesting chat about possible future collaboration, much of the time standing in front of a large framed copy of Gandy's painting of the Bank as a classical ruin. Seeing it blown up to that size and sharing ideas with another well informed observer, I started to notice all kinds of things I hadn't really seen before. For example, there is some very useful information about the roofscape in the south-west corner of the Garden Court, including Soane's first floor addition. There are several drawings of this, but I couldn't work out how it related to the internal parapet/balustrade. Then there are the lanterns and chimney stacks above the rooms along Threadneedle Street. Very clearly shown in the "ruin painting", but obviously changed some years later, as one of the demolition photos shows. So always there are these detective games to be played. In the painting there is no door leading into the governor's office and the window giving onto the corner of the waiting room court is altogether wrong. Poetic license I suppose. Elsewhere in the museum displays there are drawings and photographs that hint at design details that I had missed: a large chimney in the printing works, & the top storey of residence court, for example. When I first started to model the outer screen wall almost 2 years ago, the parapet was a real brain-teaser. I think it was Cockerell who completely ruined the proportions by extending it upwards under instruction from his client. A demolition photo that I had not studied before seemed to suggest that Soane's original pedimented column caps were somehow hidden behind the new extended parapet. Eventually I realised that I had the viewpoint wrong, this was taken from Bartholomew Way, and the dome being demolished is Taylor's entrance vestibule. I'm starting to think there must be a lot more demolition pictures and I'd love to study them. I've long been wondering whether the walkway around the battlements had an internal railing, or if the night guard just had to walk carefully whenever they passed an internal courtyard space. Nothing shown on the drawings, and demolition photos I saw at the museum suggest a simple stone shelf with no guarding to the inside. It would be helpful to engage a wider community of Soane enthusiasts on questions like this. For the Board of Trade, Soane wanted to use the same version of Corinthian as he had at the Bank. (Temple of Vesta, Tivoli) His clients insisted on Jupiter Stator and he produced an interesting set of comparative drawings in his (unsuccessful) attempts to dissuade them. On this visit, I noticed that the two types of capital co-exist today in Threadneedle Street. The Royal Exchange opposite the bank boasts capitals of the Jupiter Stator type. Soane argued that the smooth curves and elaborate entablature of Stator were appropriate to the size and scale of the original. while the simpler, more compact form of Vesta worked better for the sizes he needed at the Bank and the Board of Trade. For the moment I am just trying to get my head around these complexities of the classical style and the question of how to represent these elements in interpretative studies. There's a lot to learn, and I'm enjoying the process of discovery as a by-product of serious modelling efforts based on diverse source material. That morning, as I set off on the train from Reading to London, the tabloids were dominated by pictures of Jeremy Corby as a caring "man of the people" contrasted against Theresa May as "cold fish" defender of capitalism. That was a remarkable U-turn and almost as disconcerting to me as their previous oversimplifications and melodramatics. I guess my view is that life in the "Western World" is rather bland and civilised compared to most anywhere else, so people blow every small blip up into a minor crisis. As for the tragic fire in London, I was relieved to receive from the RIBA a balance between solid practical design advice and a plea to reserve judgement while a proper investigation is carried out. I find myself pondering the fine line between idealist and idealogue. It's so tempting to stoke the fires of indignation when you have nailed your colours to a noble cause. Multi-culturism is a hot topic these days and I've been watching a number of discussions on YouTube. Once again I am suspicious of polarised opinions and the false dichotomy of left-wing / right-wing. That categorisation seemed to make a lot of sense when I was younger, but just as my understanding of classicism has become ever more layered and complex ... well, I think the political issues of our day don't respond well to sweeping certainties. I do feel that the enlightenment values that meant so much to John Soane are hugely valuable. They certainly imply an opening up to "other cultures" as is immediately obvious in the diversity of his own collections. But the museum is also a protected world. The richness of its contents is preserved within its boundaries and by the strict conditions of entry. I was interested to learn, during this visit, that he was in the habit of turning visitors away on rainy days (often by subterfuge) because he wanted people to see sunlight streaming through his wonderful daylight contrivances. Before moving to Reading I had spent the weekend with family. I got the chance to see Salisbury Cathedral at last. Here is a building erected over a 38 year period some 750 years ago, and substantially intact. The balance between regularity and irregularity is therefore intentional, rather than being the result of pragmatic changes made by succeeding generations. I used to characterise Gothic as "organic" and Classical as "formal" but once again, this is far too simplistic. At Salisbury the overall scheme is very regular and symmetrical with variation confined to elements such as column capitals. This is worthy of Soane himself, as we will see, but the extent to which those capitals vary is rather greater than you would expect in a classical composition. Salisbury itself was a walled city with several gates, some of which are still visible. Soane's Bank of England expresses this walled city idea in its overall form, a reference perhaps to the medieval guilds from which modern banking emerged. Everything I do on this blog, (from Project Soane to studies of Sash Windows, or reflections on the intersection of Art with digital technology), is an attempt to make sense of our history as a city-building species. Civilisation, Cities, Agriculture: it's an integrated package we've been living with for several thousand years now. That package has a down side of course: waste-disposal, disease, warfare. My grandson Jack had chicken pox while I was there, a classic example of the kind of species-jumping virus that helped Eurasians to conquer new worlds. Salisbury was actually an afterthought to a farm open-day visit which gave Jack a chance to sit in a combine harvester and ride behind a tractor across rolling meadows, where free-range cows manufacture milk for city dwellers. Many of our domestic animals live in cages of course, raising yet more complex moral questions. Personally I don't eat meat (never have) but I do consume milk, eggs and fish. It was fun to watch the cows being milked on a giant, rotating machine. Towards the end of our visit, my son spent time with Jack in the play zone, and drew a picture in the typical laconic style he developed as a child over 25 years ago. He works in the digital sphere and thinks of himself as a bit of a geek, but I've always been impressed by the fluidity of his visual imagination. Drawing is a way of thinking. To me it is one of the most fundamental underpinnings of BIM. I'm referring to drawing in the broadest sense: a way of attending more closely to the world around us. That was Sunday. On Saturday we visited The Vyne, an Elizabethan mansion close to Basingstoke. Soane lived in the age of picturesque landscape gardens, when designers strove to emulate the wild and the natural. Elizabethans followed an earlier Baroque tradition when gardeners bent nature to their will and imposed formal geometries upon the plant kingdom. Inside the house I was interested by the way some of the doors were constructed. These old buildings have thick walls. The door openings usually have "linings" which are framed and panelled in a similar way to the doors themselves. (unlike modern doors which tend to have solid frames) Looking at photographs of the Bank I noticed that doors are almost always on the side facing the photographer. How could this be? I've been wondering if they have doors on both sides with a gap between. That would help with soundproofing of course, which might be important in rooms where confidential discussions are held. At the Vyne, there are openings with a normal door on one side and a pair of shutters on the other, that fold back into the lining. This is quite similar to the way shutters are built into the sash window linings (except for the position of the hinges) It's pure speculation at the moment, but I wonder if this idea was used by Soane at the bank. I've recently become aware of a thing called HBIM (Heritage BIM) In a way it's a parallel strand to the kind of work I've been doing. It's the Commercial version of my "hobby" perhaps: day job v private passion. Of course that's an oversimplification again, a caricature. But there is a heritage to be preserved, much of it (like The Vyne) is open to the public, and why wouldn't you use a collaborative, BIM approach to the restoration and maintenance work. I'm not sure how this has impacted on the current restoration work taking place at the Vyne, but luckily for us that work has been opened up to the public. There is a scaffolding "tent" spanning the whole building so that they can take the roof to bits, record what they find, and decide how to restore it. It's a complex structure built over many generations with different materials. Mostly it's a series of steeply pitched clay tiled roofs, but slate was also used , and some low-pitched sections were covered with lead. I really enjoyed seeing the diagonal boarding and the support for the raised joints between the lead sheets. I spent most of the previous week in London, primarily pursuing Project Soane. On the evening after the general election I found myself strolling through "change alley": the narrow passages where modern finance took shape in fashionable new coffee houses. Tobacco, coffee, sugar, Spanish gold, stocks & shares: these are some of the factors that combined to overturn the world of medieval guild halls whose traces still remain in the City of London. Which brings us to the Bank. I've walked around the screen wall many times now, and I'm very familiar with what is Soane's and what has been simplified and juggled around by Baker. But while I'm here I might as well take a few more photos. I decided to zoom in from afar to capture the Vesta/Tivoli capital "side on" and check the proportions of my current interpretation. Suddenly I noticed for the first time that the flower motif comes in different versions. I've spotted three. What's more some capitals have type A on the side and type B on the front. In the side rows of six columns, there is a symmetrical alternation of types. So is this Soane or is it a little joke inserted by Baker? Well Soane did use types A & B, that much is clear from pre-demolition photos. Tivoli Corner is all type B, and the centre block on Threadneedle street is all type A. (before and after in both cases) I'm pretty confident about the alternation of types in the side ranges of 6 as well, but the resolution in the printed versions of Yerbury's photos is not so great. On the way to the Bank, I had taken another look at Walbrook Wharf. This is where one branch of the ancient watercourse entered the Thames, and there is still an outfall there, although I couldn't get down to look at it because it was high tide. Most of the water flow was diverted parallel to the Thames in Victorian Times, part of Bazalgette's sewage system. Further upstream Walbrook followed the original route of Princes Street and therefore still flows underneath the Bank, cutting the corner diagonally from the old Doric Vestibule entrance and heading towards St Margaret Lothbury. Although the water borne sewage no longer flows into the Thames, much of the City's waste still floats down that way inside containers, neatly stacked on Barges. Earlier in the day I had spent a morning at the Victoria & Albert Museum. First time to go inside. I'm usually so busy looking at the architecture of the streets that I don't get around to exploring the museums and galleries. I went to take a look at the architecture section. Saw some interesting, rather loose interpretations of Corinthian. Two of them are part of the building itself, so that's down to C19 free eclecticism. The others are from the height of the Italian Renaissance, demonstrating how inventive architects could be during that hallowed period. At the conclusion of the Architecture section, there is a large drawing of St Paul's cathedral. Don't have a date for it, but the named collaborators were active about a hundred years ago. It's a cutaway isometric revealing the construction and seems to me once again to show how BIM is simply a continuation of earlier drawing traditions. 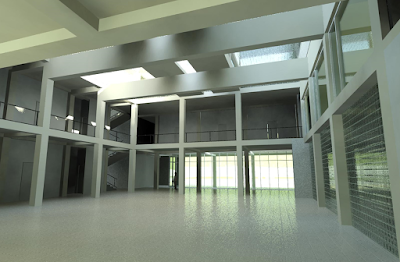 I see BIM as a thinking tool and a way of opening ideas up to enable collaboration. Earlier on there was a drawing by Eric Mendelsohn of the main staircase in his De la Warr pavilion. I'm for ever chasing this kind of expressive spontaneity using digital tools in a BIM context. There is a clear and present danger of "design" and "production" becoming confined to separate silos. I did start to model that building after visiting it 3 years ago to see how it had been restored. Yes modernism is also part of our heritage, and subject to another polarised debate. I guess I am arguing for less of the polemics and more serious, practical, hands-on research. There's another spiral stair in the V&A. This one is solid oak, and originated in a town called Morlaix in Brittany. It comes from a type of house with a central hall (a common medieval feature) This one fell into disrepair, was removed from the house, acquired by a private collector and passed on to the V&A around 100 years ago. I was impressed by the huge solid sections of hardwood used in medieval construction in Europe. Imagine living in a world where you treat oak almost as we treat concrete today, a primary structural material. The previous afternoon I had visited Pitzhanger Manor for the first time. You can't get inside because it's under renovation, but the public park behind is accessible. This used to be John Soane's "country estate". Here we have the romantic, picturesque, enlightenment landscape. Soane used random knapped flint occasionally in his work to evoke a rustic feel. It's found here in a playful bridge design and in the entrance gateway to the house. Note also, yet another interpretation of the canopy dome that inspired the classic red telephone box. As chance would have it there is a modern reinterpretation of that design just across the street. Maybe we should design a mobile phone inspired by his starfish ceiling motif, as a twenty-first century continuation of that tradition: a Soane-Phone. 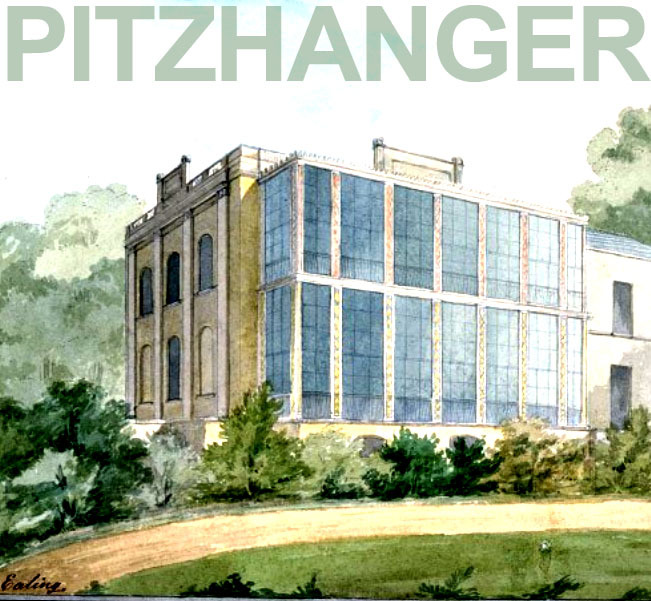 Pitzhanger is in Ealing. I took the district line out there after walking around Whitehall. I wanted to just deepen my connection to the area where the Board of Trade building was built, and to get better reference photos of Kent's Treasury. I already had quite good photos of his Horseguards. and of Scott's Foreign Office, which is nominally classical but somewhat Gothic in spirit. There are allegorical figures referencing the British Empire's civilising mission. I was drawn to the african mother and child with a banana plant and a hippo in the background. Easy to be flippant and condescending about the past. My intention is to engage a little more deeply with the subject matter, to keep probing and revisiting the sources. The day began at Chelsea Hospital, a Wren project that Soane added to, though most of his contribution is now lost. There are fragments remaining, the most substantial, and best known being a stables block. Lots of interesting things here. His dramatic use of concentric arched recesses is much admired. I was drawn to the brick corbelled eaves, which I had also recorded at the Soane Museum. He used this idea many times during his career, yet another example of variations on a theme. It's amazing how inventive you can get with a simple idea. In music, I find myself endlessly revisiting the 12 bar blues and there always seems to be something fresh waiting to be found. When I got back to Dubai I was moved to model this detail to get a deeper understanding. So far I've only done the Chelsea Stables version. I drew it out in elevation first (2d modelling) then used a simple parametric cuboid family to explore the modularity. It gets out of step with the Flemish Bond below, but hits the same spot every six brick lengths (in theory at least) The overall impression is of a highly abstracted version of a Doric entablature, vastly cheaper than the carved stone version of course. Mr Soane had quite a few tricks up his sleeve and a deep understanding of the building trades. That was my second day in London. The first was devoted to the Soane Museum. I enjoyed two guided tours, a free walkabout with sketchbook in hand, and a very enjoyable second meeting with Sue and Frances, who work there. Members of the Heritage professions you might say, but very willing to engage with amateurs like myself. We had a very fruitful discussion, and I made lots of new observations, including the fact that Soane's window sashes don't extend at the corners to form "horns". This made me look closer at other older buildings, and I realised that horns must be a rather late development. The idea is to guard against splitting of the wood when the mortise hole is close to the corner and you are driving in a wedge to tighten up the fit of the tenon. I guess the older craftsmen were more confident in their ability to get things "just right". I also noted how very delicate some of Soane's mouldings are, introducing an extra curve into the section of the glazing bars (muntins) for example. It's fascinating really how he ranges from highly abstracted and simplified to finely detailed and delicate. I think he really enjoyed exploring the full range of possibilities, not to mention agonising over what was appropriate in each particular circumstance. That brings me to the first weekend of my stay, another family affair. We took a drive down to the coast, a place called Lepe, opposite the Isle of White. I was testing out my new camera and zoomed in on a couple of guys digging for shellfish. It strikes me that this is a link to our beachcombing ancestors who drifted out of Africa, all the way down the coast of India and island hopped to Australia. What kind of tools did they use to dig up the mud I wonder? What was it like to live in that world? Will humans still be around 70 thousand years from now, digging in the mud for food? The current lock screen for my ageing but much loved green Windows Nokia is a photo from that weekend. I'm sleeping on the living room floor on an air bed, and Jack comes in to play with his grandpa, still spotty-faced but much more lively than the day before. That was a special moment for me. Basingstoke is classic, post-war, English new-town planning: pedestrians segregated from traffic, ring road with roundabouts, semi-traditional housing in a variety of materials mixed in with apartment blocks, neighbourhoods clustered around schools, local shops and playgrounds. But it also has quite a deep history and walking into town with my son Joe on the first night, I was surprised to see how close he lived to a charming little "village square" with parish church and timber-frame housing clearly dating back to Tudor times. How English can you get? And how seemingly natural and unspoilt. Am I fooling myself? In the course of my journey from Dubai I picked up some reading matter (as you do) The Economist was concerned about polarisation in British politics. Will Labour dive into this gaping hole and claim centre stage again? It didn't seem possible when I bought the magazine, but less than a month later things have changed quite dramatically. It seems as if they could, but do they want to? Or perhaps I should ask if they can find the unity of purpose to do something so sensible as appeal to the middle ground? Or maybe ... whether they can target the "average brit" without selling their souls? Melodrama raises its ugly head once more. I have started to read an interesting history of consumerism. There's another tainted word. I think it's worth trying to understand the history. Most of us feel that we accumulate too much "stuff" and generate far too much waste. But our economy is based on growth and crude attempts to impose a new model seem to make things much worse. Can we evolve a more stable, sustainable economic model over time? Over to you Jack. I've tried to describe this visit as part of ongoing attempts to study human civlisation using my "BIM pencil". Part of the fascination for me has been looking at something a second time, then a third and fourth time, gradually realising what a depth of history and understanding can be extracted from the source material by engaging with it over an extended period of time. So every time I go back to the Bank of England, or the Soane Museum, or to the City of London as a whole I am drawn deeper into this endlessly fascinating story.